There are two types of group interviews, and your experience will vary depending on which one you're participating in. Both can be challenging for candidates. Find out more about the kinds of group interviews that take place, what questions to expect, and how you can shine during this type of interview. In one type of group interview, multiple interviewers (sometimes called a group or panel) meet with and interview a candidate. The panel typically includes a Human Resources representative, the manager, and possibly co-workers from the department where you would be working, if hired. 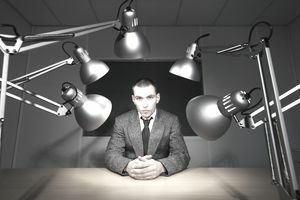 In another variety, multiple candidates are interviewed at the same time by one interviewer (typically the hiring manager). In this scenario, you and other candidates would be interviewed together, in a group. Sometimes, a group interview combines both types of interviews: you might be interviewed in a group, by a panel of interviewers. When there is a panel of interviewers, a group interview becomes an efficient way to introduce job seekers to all the people he or she would be working with. Companies may also conduct group interviews because they show which candidates work well with others. A group interview will also show an employer which candidates will fit well with the company culture. Jobs involving high stress, fast-paced work, or customer interaction also commonly require group interviews. If you perform well during a stressful interview, you may be more apt to perform well doing a job that is stressful. There are a number of formats for group interviews. For an interview with multiple interviewers and one candidate, interviewers tend to take turns asking the candidate questions. There is more variety in an interview with multiple candidates. Typically, the interview will involve the interviewer/s asking each candidate group questions, as well as individual questions. The group interview might even end with everyone having brief individual interviews. The interview may also involve a work simulation or problem-solving exercise, in which the candidates have to work together as a team. This gives the employer a chance to see if you can work well on a team project if you are a natural leader and if you get along well with others. Sometimes, the group work will end with a team discussion or presentation. Below are questions one might be asked during a group interview. The list includes general questions an interviewer (or panel of interviewers) might ask a candidate, as well as questions an interviewer would ask regarding a work-simulation exercise. Describe your career history and future goals in 30 seconds. What was your personal contribution to the team's performance? Be prepared. Take the time to prepare for the interview by reviewing the interview questions you'll most likely be asked, making a list of questions to ask the interviewer, and brushing up your interview skills. Be confident and respectful. You want to make sure your voice is heard during the interview, but you also do not want to dominate the interview. When you see an opportunity to speak, calmly do so, but do not cut other people off or appear too impatient and competitive. Be a good listener. An important part of working with a team is being a good listener. Listen carefully to what both the interviewers and your fellow candidates are saying (use body language to signal your listening). When you answer a question, refer back to what the person before you said, which shows you were listening. Try to quickly learn (and say) the names of the candidates and the interviewers, which will further demonstrate your listening skills. Be a leader. If you are working on a team project, find an opportunity to lead. This does not mean steamrolling your group. Leading can be as simple as including everyone and making sure everyone has a task. If you reflect on the project with the interviewer, be sure to give credit to your teammates. Be yourself. While you should make your voice heard, do not feel like you have to be extremely vocal if you are shy. Answer questions thoughtfully – it is better to answer a couple of questions with purpose than to talk a lot without purpose. Being a good listener who answers questions carefully can still set you apart from the group without forcing you to be someone you are not. Follow up. Be sure to send a thank you letter to every interviewer in the panel. Try to mention something specific about your interview to help the employers remember you.